The following account was largely drawn from the Nassau Guardian and Freeport News of the Bahamas. Some of the background research was done by myself and any factual errors are my own and unintentional. I think it serves to illustrate how an insidious crime can infect and corrode an entire nation. This is the second and concluding half. When three boys went missing from Freeport in May of 2003, the entire Commonwealth of the Bahamas experienced a sense of unease, concern, and a shared bafflement as to their fates. An almost forgotten case of twenty-two years before was resurrected--another instance of three young boys gone missing and never to be seen again; also in the month of May. Satanic sacrifices and witchcraft began to be discussed and the people's unease soon became suspicion and fear. The police were unable to shed any light on the circumstances even with the help of a team of FBI profilers. Then...Junior Reme disappeared from his Freeport home one morning in July. Fear graduated into terror and xenophobia. A mysterious grey van was reported to be trolling the back streets of Freeport for little boys; its occupants always in shadow. With a fourth boy now added to the list American television was enlisted in the search, and Adam Walsh of 'America's Most Wanted' offered his services. An episode featuring photos of all the boys was duly filmed and aired--all to no avail. Still there were no witnesses, no new clues...only silence. Rallies were held in support of the suffering families with massive turn-outs, but still nothing broke in the case. Two months after Junior Reme's disappearance, September 28th, a fourteen year old boy did not return home. Desmond Rolle became the fifth name to be added to the list. The devil was at his play in the Bahamas. 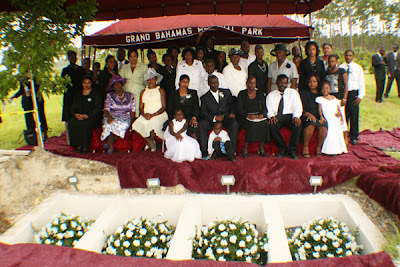 The Nassau Guardian appealed to the mothers of the Bahamas to search their hearts when it came to their own sons...could they know something...could they be somehow involved? The public, in their turn, castigated the police on their lack of progress, and accused them of being concerned only with the tourists and wealthy; not the poor and working people that appeared to be the target of this plague of disappearances. The rifts that had begun in May grew wider and uglier. Haitian immigrants, long a source of heated debate within the Bahamas, came under an ever closer scrutiny. Their ways were not the ways of Bahamians: Whereas the Bahamians spoke English, the Haitians spoke Creole French; the natives were by and large Protestants, the immigrants were Catholic, the Bahamians prized good behavior and obedience to the law, the foreigners had come from a lawless, violent country. Perhaps more importantly was the Haitians legendary Voodoo practices--were these not Satanic in nature? Though some Bahamians practiced a similar alternate religion call Obediah, it was not generally accepted. October was to change everything--On the third of the month Assistant Commissioner Ellison Greenslade announced that more than three persons had been taken into custody as a result of "substantial" tips received by the police. He added that the police still had reason to believe that the missing boys were alive. He also made clear that Desmond Rolle, the latest victim, had been a packer at the local Winn Dixie grocery store just as the others had been and that they now knew all the boys had frequented the same downtown video game store. He refused any information on the suspects in custody. Immediately following the press conference, a team of policemen descended upon the Winn Dixie, as a large crowd gathered in the parking lot and rumors began to swirl of refrigerated body parts. The police denied the rumors: "Absolute Hogwash," said Greenslade. There were still no boys. The following day, when pressed by reporters, the police stated that they had nothing major to report. When the liaison officer was questioned as to rumors that the boys may have become victims of 'organ harvesters' for the medical black market, he responded that there was no evidence to substantiate such a thing. The police continued to be tight-lipped on the suspects in custody. Meanwhile CNN aired a story on the disappearances world-wide and a cruise ship cancelled its trip to Freeport. By October 8th it was learned that several mothers and their juvenile sons were being held by the police. The story was broken when one of the mothers complained to the media after her release that she wanted her boy back, and that she was contemplating suicide as a result of their treatment. It became understood that three; possibly more, juveniles, some as young as eleven, were being detained. The police had 96 hours in which to hold them without charges. Citizens reported extensive police searches going on in a wooded area to the rear of the Tivoli Gardens apartment complex. On another front, Member of Parliament, Lindy Russell, decried the intrusive and disruptive nature of the media's handling of the entire crises, and accused them of hurting the families and hampering the investigation. He further castigated his fellow MP's over their lack of action in the matter, and said the government must move swiftly to assist families in socially depressed areas that can become catalysts for sexual exploitation of children and adults. On October 10th, the police released a bombshell when they announced that four boys were being charged with the manslaughter of Jake Grant, the first of the children to go missing. The youngsters, ranging in age from 11 to 13 were indicted at the Grand Bahama Island courthouse late on a Friday morning. It was the first substantial break in a case that was now five months old and with as many missing children. Three of the arrested boys were Haitian nationals. During the arraignment a large crowd had to be held back on the courthouse lawn by a combination of police and Defense Force officers clad in army fatigues. The crowd and media was reminded over and over to stand back as they continued to inch forward. After just an hour the boys were escorted from the courthouse to a waiting bus and the horde of on-lookers surged forth. Screams of "my boy" and "they little boys" were heard and reported by the press. An ambulance was summoned to treat a woman who had collapsed. As the police bus sped away with the boys to the airport, from where they would be flown to the Simpson Penn Juvenile Detention Center in Nassau, people wept and clung to one another. Some family members became angry and began shouting at the police, but a heavy rain shower intervened, dispersing the irate, sobbing crowd to their various homes. The remainder of the missing boy cases were being treated separately according to a statement from the police. The public remained anxious and confused. Rumors spread quickly on October 26th that two bodies had been discovered at Freeport's Barbary Beach and that a man was being held in custody. The police denied the rumors. Three days later, Cordell Darrell Farrington, 35, a warehouse worker for Kelly's Freeport Limited, was charged with five counts of murder--that of the four remaining boys and an adult who had been missing since 2002. He had turned himself into the police. It was also revealed that the police had recovered five skeletal remains in a remote pine forest on the eastern part of the island. Police said that Farrington, a Bahamian national, met the boys informally and was able to gain their confidence before murdering them. It appeared that, at last, the six-month reign of terror was over. Cordell Farrington pled guilty to manslaughter in the deaths of Mackinson Colas, Deangelo McKenzie, Junior Reme, and Desmond Rolle. He was later convicted of murder in the case of the adult, Jamal Robins, 22, who had allegedly been his lover. This conviction was changed to one of manslaughter in 2008 due to the court accepting proof that he suffered from a severe personality disorder. He was the eldest of five children. Jake Grant's body was never discovered. It was alleged by the police that he had been drowned in a swimming pool by the boys charged in his death. Several years later the charges were dismissed. Jake's mother still holds on to the hope that he will be found. Farrington's mother, who was also a victim in all of this, stated that, "We will never be known by our name anymore." The boys funerals were not held for over a year pending forensic testing on their remains. Wow. Thanks, David. What a strange convoluted case… but what murder isn't peculiar? David, I was with you all the way to "severe personality disorder." As a mental health professional, I can't think of a diagnosis of any one of the various personality disorders that dictates uncontrollable violence or excuses a murderer from responsibility for his acts. Wondering if you have more info. I'm sorry, Liz, but I can't add any more to the diagnosis. I couldn't find very much written about Farrington, or the actual trial. It appears, however, that a "severe personality disorder" (whatever that may mean) was viewed as a mitigating factor in sentencing. The obvious premeditation and planning that went into his crimes make me a little less sympathetic to his "disorder", however. Very tragic case. Like Elizabeth, I am a bit confused as to what Farrington's motive was, though . . . suffering from a personality disorder (even a severe one) is not exactly the same as being criminally and homicidally insane, is it? But at least the victims' families have closure and can move on with their lives. The islands are not the same now like we were infected. Some people blame drugs, tourists, casinos, poverty, but we lost innocence.